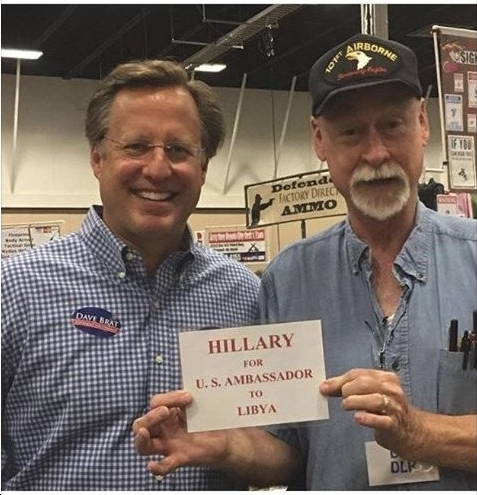 Reason #infinity that Dave Brat needs to be voted out of Congress in November 2018. And yeah, that’s even if he belatedly takes down the disgusting post, which Brat pathetically blamed on “a new staffer [who] made the post without his approval.” Also gotta love these detail: 1) “The picture was taken at a gun show in Fredericksburg on Saturday” (but of course — where else? LOL); and 2) Brat blamed the “hard left” for using “vitriolic language,” so…who knows, but apparently Brat fits the classic right-wing pattern of always blaming others and never taking responsibility for their own actions.